Thing I learned today... There are known upload size restriction for various browser. You can see details here http://www.motobit.com/help/scptutl/pa98.htm So, if you are using af:inputfile to upload huge files and configured all file upload parameters as described here, still not able to make upload to work with huge files, check out the browser support for the same. Noticed the following requirement (multiple times) while working with ADF developers - Find out rows in the default row set that meets specific conditions - In other words, perform in-memory filtering without affecting the primary row set. I'm attaching a simple example that illustrates a possible solution to display number of rows(new, modified, deleted) posted to database when user commits transaction. 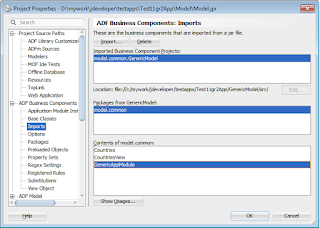 Consuming ADF BC model project components from another project ! The above things are well and good. However if you you want to consume a ADF BC model project within same workspace, there is an easy way.